Sixteen lucky supporters of President Trump closed out 2017 with a moment they will likely never forget. 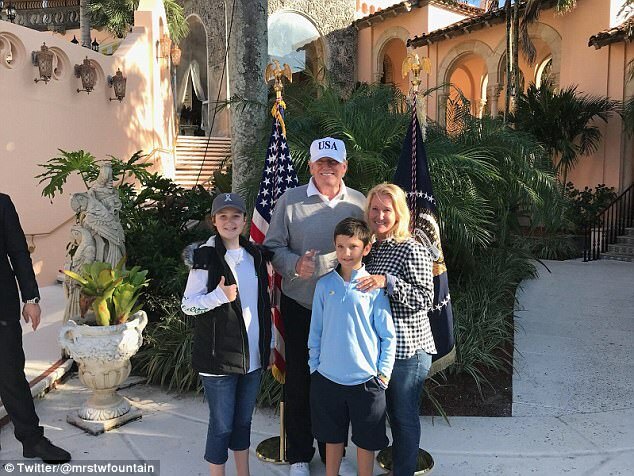 More than one year after a dedicated group of men and women began taking up residence on the Southern bridge any time President Trump was in town, their Commander-in-Chief finally came through in a bag way by inviting a small group of them back to his private club. Secret Service agents arrived at the bridge on Saturday afternoon shortly after President Trump drove by waving at the crowd, circling back to round up 16 lucky individuals and ask them to get in a van down by the river. Those who were not selected for the Mar-a-Lago field trip instead got pins. Once the group arrived at the club they were given a private audience with President Trump, who gave them a tour, posed for photos and even fed the group. Gisella Garneau, one of the individuals who was hand-selected by Secret Service to make the journey over to Palm Beach, wrote about the experience on Instagram. 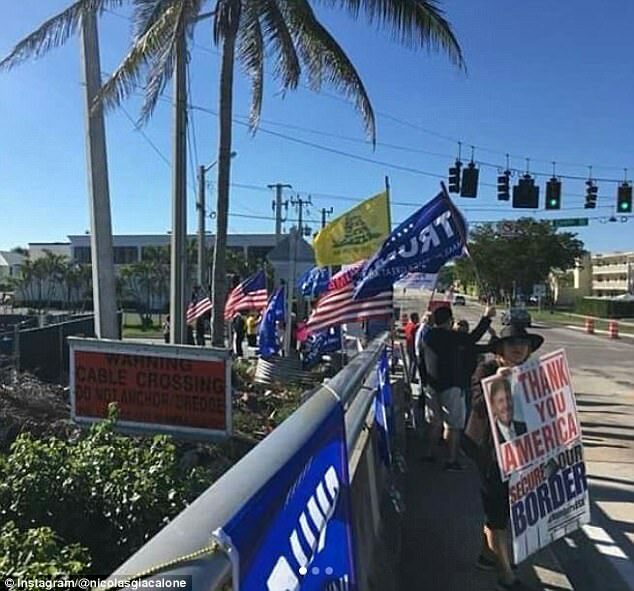 'When President Trump drives by and sees his supporters waving flags and signs he tells Secret Service to pick us up and invited us over to Mar-a-Lago to thank us! How great is that!' wrote Garneau. She also included a large group shot with her fellow fans. When one follower congratulated her and asked for more details, Garneau again could not say enough good things about President Trump. 'He was amazing! He took a group picture, then he took individual pictures with us, then invited us in to the living room to look around and they give us a mini tour and then they took pictures of us individually at the Christmas tree in the living room,' she explained. 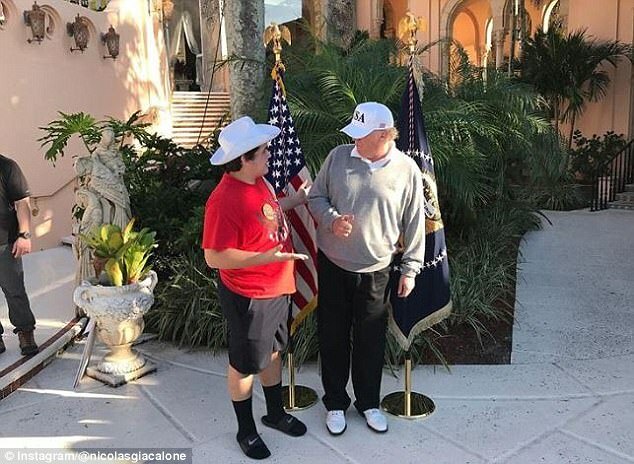 Nic Giacolone was also selected for the Mar-a-Lago excursion, and posted a number of photos taken around the property. 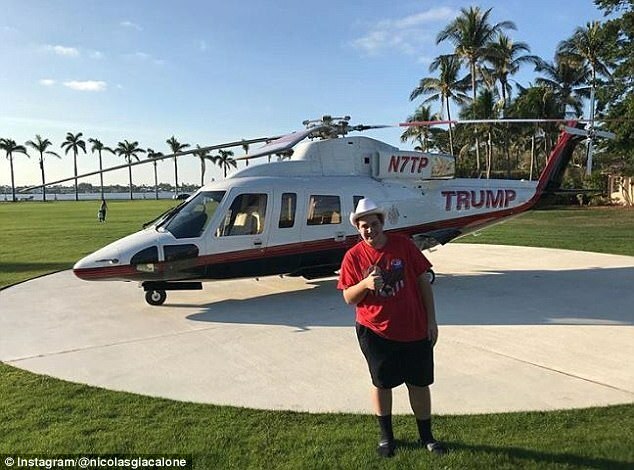 In addition to one posing in front of the Trump Organization helicopter, he also shared an image of himself talking with President Trump and another of the two men giving a thumbs up. The guests then headed inside to poke around the living room, pose by the Christmas tree and enjoy their buffet lunch of cookies, meatballs and fruit. Then it was time to clear out, and prepare for another day out on the bridge. God, what a prince Trump is.